Josh Hutcherson and AnnaSophia Robb created a magical world as the main characters in “Bridge to Terabithia,” but off-camera they were enchanted by their real shooting location, New Zealand, where they spent three and a half months. Making “Terabithia” was almost like stepping into Middle-Earth. Hutcherson, 14, was disappointed that he didn’t have time to visit the Weta Digital facilities in Wellington. “I didn’t get to ’cause I was working,” he says, “but AnnaSophia got to go and check out their whole studio. 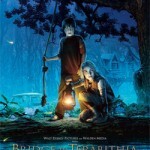 Bridge to Terabithia #2 for the Weekend!